We are able to offer a wide range of distribution and freight management services with a fast turnaround, including freight forwarding, European express services, and parcel solutions. Whether you have a parcel, one pallet, a full, half or hazardous load, we can arrange a suitable transport solution to fit your needs. With an extensive portfolio of services in Europe and further afield, we are always in a position to find you the best transport solution for your requirements. Through our global network of transport providers, we can provide transport via road, rail, air and sea. Additionally, if you do not want to deal with all of the customs paperwork that comes with shipping overseas, we can handle that for you, as well as dealing with the cross dock management if necessary. For many shipments, we can provide a 10am next day delivery service throughout Europe. We can also provide short notice collections from almost anywhere in the UK and Europe for quick onward delivery. If you require courier services anywhere in the world, our innovative Parcel Price Portal courier comparison website will find you the best rates between the top four international parcel carriers, saving you time and money. We believe in delivering a total freight management solution with a personal touch for every one of our customers. 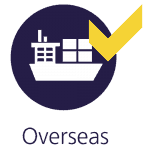 If you would like more information on any of the services we provide or if you would like to discuss with us your shipping requirements, please do not hesitate to contact us at info@eurosonix.co.uk or telephone 01422 387530 24 hours a day.